21 First Street has become something of a mecca for didgeridoo players. Every year, at the beginning of May, hundreds of didgeridoo players come from all over the world to attend the annual Didgeridoo Festival (part of the Pine Creek Gold Rush Festival), at Copperfield Dam, 85km north of Katherine. 21FirstSt serves both as a meeting point and practice venue for this event, and for the Barunga Arts Festival, which takes place in the first week of June. 21 First Street is also a popular stop for tourists passing through Katherine (largely as a result the write-up in the Lonely Planet), who come to see our range of painted, natural and carved didgeridoos, take a FREE tour of the workshop and have a go at playing an authentic Northern Territory didgeridoo. 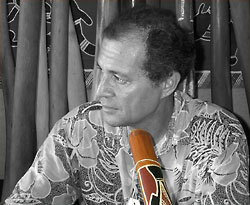 Richard Williams (aka "Coco"), has been making didgeridoos in Katherine for the last 7 years. He served a 2 year apprenticeship with the Wadaman tribal elder, Bill Harney, but says that there is much to know and that he is still learning. 21FirstSt sells didgeridoos by sound. Each didgeridoo is assessed for quality based upon it's accoustic properties and its ease of play and assigned a Sound Score. The higher the Sound Score, the better the didgeridoo sounds and the easier it is to play (or 'drone' in music terminology). A didgeridoo that is easy to play has a good back pressure that aids circular breathing - particularly important for beginners learning to play.